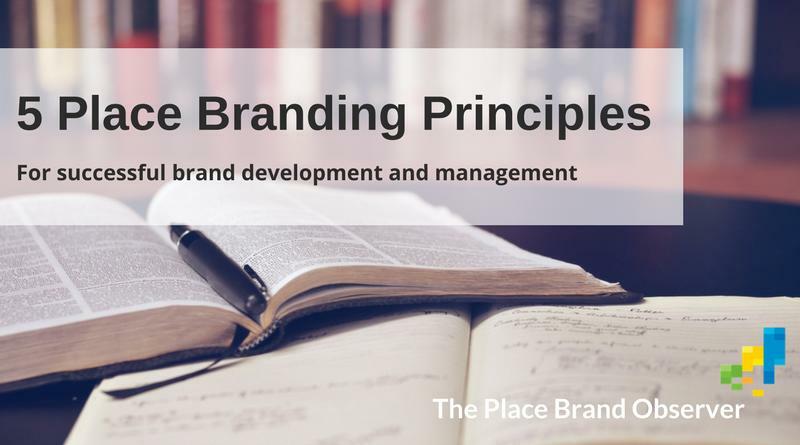 Place Branding Principles: In a globalized world, places increasingly vie for attention. In such a highly competitive environment, place branding can help by building competitive identity in order to influence perceived images in relevant markets. In particular, sustainable competitive advantage can be created by building brand equity in relation to the identity of the nation, region, local area or city or town. We think that place branding is about bridging gaps between: the identity or sense of place; its product offering; the experience that visitors (tourists, expats, potential investors and traders) get when they visit; and the image / perception that people have of a place. Communication (which is not the same as advertising) is an important policy area that can be exploited in bridging these gaps, but probably more important in place branding is ‘construction’ and ‘cooperation’ (or ‘placemaking’). Construction is about product development or real actions / policy initiatives that support the brand claims (e.g. development of infrastructure, events, cooperative quality improvement programs, as well as the creation of icons or other symbolic actions). Cooperation is about finding common ground between stakeholders, private and public sector and civil society, in order to determine what makes a place unique and attractive and to make sure that institutions, companies, but also residents “live the brand”. To put it differently: we agree with prolific place branding author Simon Anholt when he states that “actions speak louder than words”. Place branding is above all about the distinctiveness of place. What makes your place unique when you compare it to other places / competitors? What are the core values of the place’s brand? What is the brand promise? the design of authentic customised and co-created place experiences in practice. In other words, authenticity in place branding is about people co-creating things that matter to them. When a place has a unique and distinctive sense of place, it becomes memorable. Memorable means that the enjoyable experience at that certain place, conquered space in your mind and your heart. So that you might think of living or investing there, or return one day. Place branding is not a top-down exercise but will only produce the best results when it is created and maintained through a strong coalition between government, business, civil society and target markets (investors, expats, travel trade, press). Place branding is not about a good slogan, logo and nice promotional campaigns. In the experience economy an integrative place branding strategy is needed to capture the hearts and attention of visitors. This means that the place brand should be supported by policies, innovations, events, structures, investments and symbolic actions.